Whether you’re an experienced climber or want to go Rock Climbing for the first time in your life… there is a big range in possibilities only one hour away from Madrid. La Pedriza and Patones are both known for the uncountable routes for both bouldering and rock climbing. In La Pedriza there are hundreds of routes on the granite slabs. The routes can are on all levels, so you will always be able to climb these magnificent rock walls. If you prefer to head off to Patones you will encounter a wide range of limestone rocks which will make you feel challenged as much as you want. 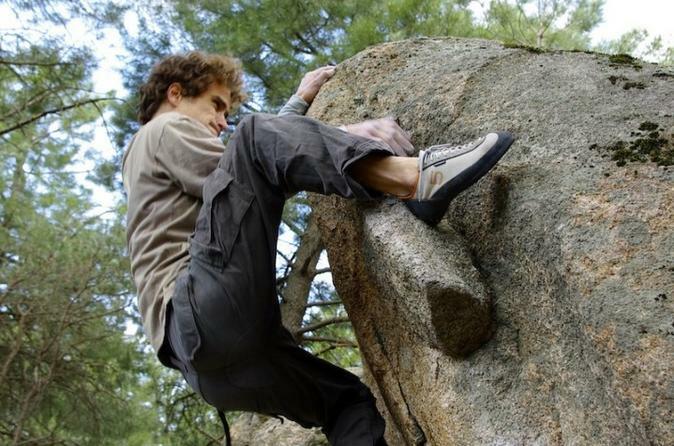 On the other hand, if you would prefer to go bouldering there are many possibilities as well. One of the best spots to go is close to the famous monastery of El Escorial. It is possible to reserve a one or multiple day adventure! You will enjoy a nice drive towards the mountains from Madrid. Maybe a short stop on the way for a coffee before the climbing will start. When we arrive at the spot for bouldering or climbing you will get instructions from the certified guide who will accompany you. Now the real fun can start! Get challenged in the Sierra de Guadarrama and enjoy several of the many routes. After a few hours on the rocks take a bit of time to relaxe and enjoy the beautiful scenery. Bring a nice bocadillo for lunch or drive off to one of the many little cafés close by. You might be able to extend your stay away from the city with a visit to El Escorial on your way back. Take a few extra deep breaths of fresh air and then aim back to the buzzing metropolitan.